Anyone got any feedback on this new all terrain foil kite yet? Not much info on their web site. Its not released yet man. They are supposed to be released early April. check out ozones Facebook. Quite a bit of stuff on new Chrono on there. 12,15 and 18m. holy ****, they are not cheap!! They are actually released now and available for dealer to order, ours will arrive soon, they are due to be completed later this week so should be in store by the end of the following week. There is at least 50% more work/labour involved in making these kites, as well as significantly more material. They are dual terrain though and have a big wind range. Lots of info starting to get around online about their stunning performance, this kite has been in development for nearly 2.5 years. It's up there with the others in between spleene x19 cheapest and new flysurfer Lotus dearest by a couple hundred each way. Also unlike Lei there all terrain, water, land and snow, they fly better inland for lakes and if you are advanced enough you could even do some para-gliding off those big sand dunes or ski fields. Hey steve, Copy and paste this on another forum and get all"Pumped me upted" . Well... an lei is actually the most multi-terrian out of all the designs. You can take them onto the land no worries. Plus you have self rescue options on the water. The problem with foils on the water is there is little or no option for self rescue options. But there are advantages for set up/pack up and durability of a foil particularly in the bigger sizes in the light winds. Tsk tsk, you should know better on all those points. Self-rescue can be more complex but is totally doable, even if you adopt the LEI method of just floating in with it. They take longer to pack up and aren't as durable as LEIs but in different ways. I don't see a mixer - has Ozone cracked the bridle shrinkage problem then? I thought we had covered all the foil self-rescue options in a previous thread. True it can eventually get water logged but in reality that never happens. I believe the Chrono has kevlar bridles. Kevlar doesn't shrink. It is stronger than dyneema but it can break without warning. I have never found bridle shrinkage to be a problem on my paragliders. I just restretch the lines from time to time. Unfortunately Ozone don't provide a line plan for any of their kites so we can't make much assessment as to what we are dealing with. The only problem I can see with the Chrono is it is outrageously, hugely, fu cking expensive!!!!!! A 17m Zephyr complete is $2600. A 15m Chrono is $2999. There is no way at all that an inflatable is more durable than a foil. None. Load of crap. If you cant pack a foil faster than an equivalent size lei then you need more experience. Yep! But the Zeph has come down a bit. I can get the 2014 version for under $2000 retail. Chrono bridles are dyneema. Ozone don't use kevlar on their kites although they have tested it. Kevlar is badly affected by UV light. Ozone bridles don't shrink, there is no need for a "mixer". The Chrono is not for beginners or inexperienced kiters. Its not for wave riders, and not for wakestyle either. If its not in your budget, don't buy it, but don't write if off for that reason, especially since no one in Oz has actually got one of flown one. Ozone bridles don't shrink, there is no need for a "mixer". That is the biggest bummer I have heard. No mixer? buggar. That means the flyable life of the kite will be reduced and it will fly****tier and ****tier until its not worth flying any more. Unless you make your own mixer. Do ozone bridles wear out through the pullies? yes. Do the pullies themselves wear out? yes. Does that mean the kite flies worse as it gets older? In my opinion the single biggest advantage of flysurfer over ozone foils is the mixer. I had hoped they had made their own version for the chrono. Really tomahawk your S3 15 and get back to me... I've had one LEI broken from prangs, vs 3 FSers Admittedly, the LEI was old and deserved to be ripped in half... but the FSer prongs were nothing more than a borked stunt and a half-wind nosedive. I've routinely done worse with my LEIs and have no issues. I don't think anyone has used kevlar on non-single line kites since forever for that very reason. Lyros line is dyneema. I just looked long and hard at the images on the web, and there certainly DOES seem to be a mixer after all... hard to tell if it's adjustable at all, but odds are good. Takes me 3 mins to launch from out of the bag and 3 mins to pack up and back in the bah from flying at the zenith. My experience is exactly opposite to yours. I have thousands of hours under my belt flying foils. I'vw jack hammered them into the ground, surf, water, driftwood. I've crashed them into cars, buildings, barbed wire fence, trees and zero dammage. none. All my foils are and intact with no repairs. The previous once i have owned also no damage. After 10 years of kiting I have not seen once instance where an lei is more robust. Alvaro already got his Chronos and is double foiling with his Kitefoil Australia Foil and gave me first feedback this morning. He said that the 15m Chrono has same power like the 17m Edge. I think it comes down to proper adjustments to the mixer. I have two foils - Flysurfer Pysho III and a Montana HQ 5. The FS I need to adjust the mixer almost every 2nd run. She's old but still flies very well and obliterates gusts like a NASA wing. The Montana on the other hand does not have a mixer and so you have to adjust the lines themselves like a LEI. She sometimes collapses entirely in the sky even at zenith when the wind is not consistant enough. In other words she is hungry for wind, unlike the flysurfer kites. I have to agree with Plums here. Without a mixer it would be incredibly frustrating to keep adjusting lines on the chrono. Soon we'll have a proper review of it I am sure anyway. yea right dude. Ozone has been making high performance foils since day one and has got the best designer out there. back to reality, the balance of compromises in kite design is so fine that even kites that look the same can easily be very different...lots of things look like copies, reality is they all use the same basic premises and learning's from the evolution of kites over the years, they all "borrow" individual ideas and mix them with there own preferences resulting in two things that may look the "same" but are not..... even little changes in bridles make enormous differences. Wholly farq look at that thing!!! It's a 'wing' alright!! I'm guessing only a select few will see the glory in such high aspectedness. Ozone foils have never had an adjustable "mixer" as you call it. Kites fly marginally less efficiently as they age, fact of life. Would take a hell of a long time to make a kite wear so much that it was not worth flying - quite a silly argument really. Interesting there is no adjustable mixer on the latest FS foil Speed 4 Lotus kite. 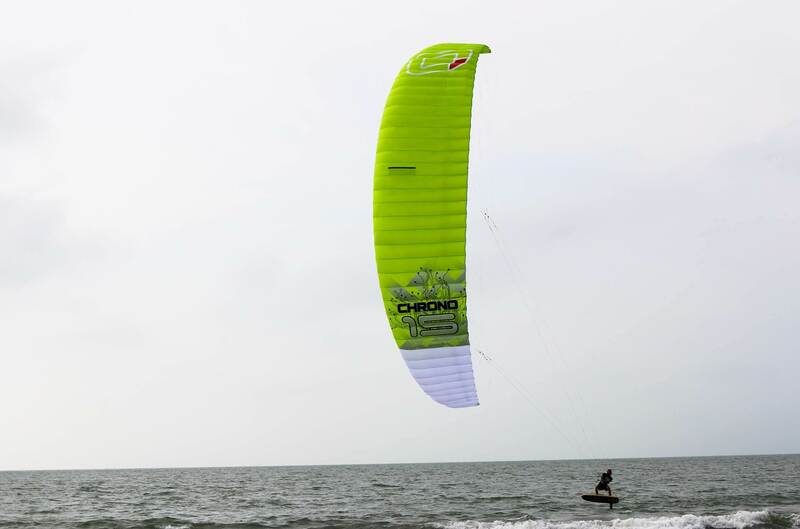 The chrono is designed so that it does not need an adjustable mixer, remember Ozone have been making high performance foil wings for longer than any kitesurfing brand has been in business. 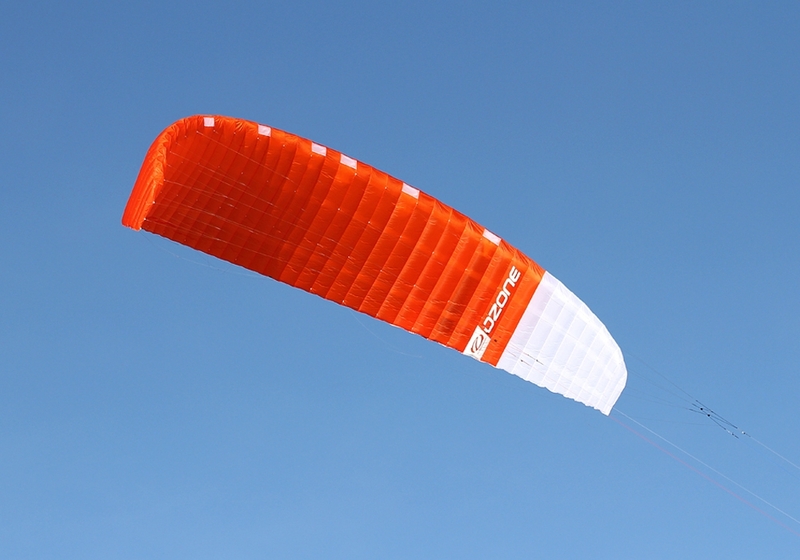 I've owned several FS kites, very complex designs (overly IMO), fly well in their mid wind range, don't rate the standard cloth kites in low winds or high winds and sold them for that reason as I used them mainly on land in buggies. Much prefer the simpler and lighter Ozone Frenzy design, now the Chrono is here I'll be very keen to give them a run on water and land, but until then everyone commenting here is just speculating and pimping their favourite toy. ...but until then everyone commenting here is just speculating and pimping their favourite toy. So... Mr kitepower. When was the last time you kept your main kite for longer than 1 season? Have you ever kept an ozone foil so long that you have to replace the depower rope 4-5 times? the pullies 2-3 times and the pulley bridles 5-6 times? Have you ever had an ozone depower foil as your one kite quiver for 3 years? Have you flown an ozone depower foil for so long, it is so worn it is almost unflyable? To you it seems a silly argument. To me it is what will happen to every foil I buy. IF I buy a chrono I will fly for 4-6 years until it is completely worn out. Have you owned ozone depower foils back to back with flysurfer foils? I can tell you with out a shadow of a doubt that an adjustable mixer is a big advantage when you plan on keeping a foil for years. Simply saying that you all you need to do is replace bridles and pullies to make the kite fly well again shows your lack of experience with old worn out foils. As the bridles wear adjustment is need as the pullies wear adjustment is needed. That's what is so good about the mixer you can tweak it as it wears and take your kite back to similar to factory settings. With no adjustment the kite just flies worse and worse. Until it gets to a point it just randomly falls out of the sky like loftywinds Montana. The exact same thing happened to my Ozone Manta. The same thing will happen to this Chrono. Its the nature of multiple bridles and pullies. But I guess longevity is not a concern for you as you will be selling up every year and replacing your kites with the latest model. For us blokes in that top dollar for our kit and have to keep them for a long time it is very important.